How Did The Bible Get Its Name? 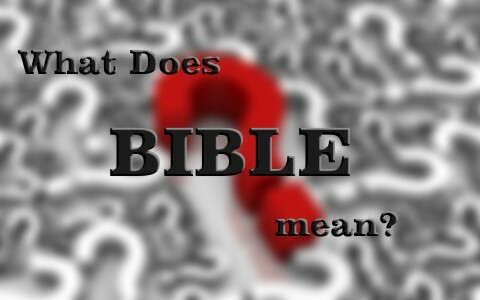 What Does The Word Bible Mean? There are 40 authors and 66 books in the Bible and many of these ancient manuscripts survive…by the thousands. Even though these books were written by individuals, in most of them God says “You shall say to the…” and “write down these words” so it was not the authors thoughts, ideas, and truth but God’s. Scripture never had a human source. Some of the books in the Bible began as letters, like with Paul’s letters to the different churches. These were collected and copied and gathered with the gospels, along with the Old Testament, and assembled into one book and out of one book (biblio) came many books (biblios), known today as the Bible. Jesus said that the gates of hell (or death) couldn’t stop His church (Matt 16:18) but He also said that the Word of God will abide for all time and nothing could prevent that either. Listen to what Jesus said about the Word of God, the Bible: “Heaven and earth will pass away, but my words will not pass away” (Matt 24:35) and since we also know Jesus’ Words are Scripture and He is the Word of God (John 1:1, 14), whatever He said will hold true for time without end. The psalmist wrote “Forever, O LORD, your word is firmly fixed in the heavens” (Psalm 119:89). The Apostle Peter wrote “All flesh is like grass and all its glory like the flower of grass. The grass withers, and the flower falls, but the word of the Lord remains forever.” And this word is the good news that was preached to you” (1 Pet 1:24-25). The psalmist declared Scripture as “The sum of your word is truth, and every one of your righteous rules endures forever” (Psalm 119:160). The psalmist had learned this long ago and so wrote “your testimonies that you have founded them forever” (Psalm 119:152). Not one of these Scriptures refers to there being any chance of God’s Word not being binding and eternal. Peter wrote earlier about the good news that was preached to the church (1 Pet 1:25) which is found in the everlasting Word of God and that the “good news” or Scripture has the very power of God behind it. Paul understood that the gospel came attached with its own power as he wrote in Romans 1:16 “For I am not ashamed of the gospel, for it is the power of God for salvation to everyone who believes, to the Jew first and also to the Greek” which was why Paul was “eager to preach the gospel to you also who are in Rome” (Rom 1:15). He knew that “the word of the cross is folly to those who are perishing, but to us who are being saved it is the power of God” (1 Cor 1:18). We can rest in the fact that God’s Word is alive and active and contains the power of God (Heb 4:12-13) which is what Isaiah was saying when He wrote what God said about His Word; “so shall my word be that goes out from my mouth; it shall not return to me empty, but it shall accomplish that which I purpose, and shall succeed in the thing for which I sent it” (Isaiah 55:11). It will not return without doing something, convicting someone, saving someone, and even angering someone. You can be absolutely certain that God’s Word will do exactly what God wants it to do. It will “succeed in the thing for which [He] sent it” out do to and there is nothing any of us can to do prevent that (not that we would). The Bible is an amazing collection of books (biblios) that has stood the test of time and its truths will remain as true no matter what society says or looks like. God never changes but He wants those who are not saved to change. God desires that nobody perishes apart from Christ and He wants all to be saved (2 Pet 3:9) but you must humble yourself and repent of yours sins. This means you must turn to God and trust in Christ. Then you will be saved. That’s what the “good book” says. Related reading about the Bible: How Do We Know the Bible is True? 1. When Paul said scripture was “God-Breathed,” was he also speaking of the very letter he was writing at the time? Is it possible, or even probable, that Paul would have demurred out of humility, assuring us that his letters were not fit to be held alongside of the Torah? 2. Am I to trust the Bible’s authority based on its own passages? If so, what makes it more of an authority than any other writing that claims divine origin? How do you address the circular reasoning that states the Bible is the word of God, because it says so in the Bible? And how could the writer apply this to the New Testament, when the NT was still a few hundred years away from being compiled, by man? 3. Was hthe compilation of the Bible by Constantine and others also divinely ordained? Paul didn’t need to assuage his own statement because “thus says the Lord” appears almost 600 times in the Old Testament and the New Testament is also God-breathed as well. YOu don’t think Paul’s letters (epistles) were inspired and fit to be placed in the Bible? Maybe I misunderstood you sir. Christians trust the Scripture with their lives…their eternal destination is based upon whether they believe it or not (Rev 20:12-15). The Bible is not like other divinely claimed books because it has empirical evidence like over 5,000 manuscripts, archeological evidence, historical evidence, and prophetic-fulfillment proofs. Was Constantine and his non biblical implements along with the non biblical implements of the early Catholic Church divinely driven? If not how are we to trust that the compilation of books THEY have given us are the only books to be called the word of God espeacially when in the 1600s we had 14 books removed including a book called “the wisdom of Solomon” who is biblicly the wisest MAN who ever lived. Are we as believers in the word (bible) to discount these once acknowledged books? if a time ever came that the Roman Catholic Church decided against the authenticity of a current writing in the bible and decreed it void are we as believers in the word to discount it also? Is their a line between the word of Christ and the doctrine of the church and are those excluded books no longer the word of God? Was they ever the word of God? Hello Blake. Jesus quoted out of the Old Testament, in fact several books, but never once did He quote out of the Apocrypha and besides, these books are not inspired as are the 66 books we have now. The Apocrypha has some historical accounts that are accurate, but when it’s about doctrine or beliefs, they have many, many doctrinal errors in them. WE know we have the Word of God today. Who determined that to be considered as an “inspired book” a book should be quoted out by Jesus? I am not sure of your question sir. If Jesus quotes Genesis or Isaiah, then we know it is inspired and by the way, anything Jesus says is inspired as He is God. Next post: What Is The Biblical View Of Magic?